Friends of a teenager who died after a brawl at a boxing match have raised more than £11,000 in his memory. 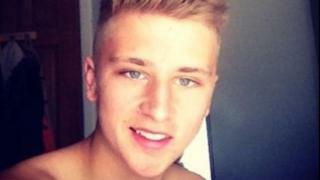 Reagan Asbury, from Pelsall, near Walsall, suffered an injury to his neck and died in hospital on Sunday. Former teammates of the 19-year-old, who played for Pelsall United Football Club, have organised a fundraising event to be held on Saturday. Two men were held over the attack on suspicion of assisting an offender, but police are still hunting the killer. Liam Buchanan, a friend and teammate of Mr Asbury's, said: "I am gobsmacked at how much money has been raised for him. "It just proves how much he was loved by everyone in the community." He said he had known Mr Asbury for six years. "He was a bit of a prankster and a great player - a great centre-half," he said. "It's not just a case of being his teammates. We are also his best friends and we just want to give him something he deserves." Saffron Houston, a schoolfriend, said it was hoped more events could be held in his memory. "He was the funniest kid in the room," she said. "He always put a smile on your face." Mr Asbury was attacked outside Walsall Town Hall on Saturday night. The venue was hosting an IBF Youth Lightweight title fight between Luke Paddock and Myron Mills. West Midlands Police said violence spilled on to the street at about 23:00 BST and are appealing for witnesses to come forward. "We know there was a large crowd at the event and we need to speak to as many of them as possible," Det Insp Justin Spanner said.